Notes: Common in woodland, plantations and parkland throughout the British Isles. Widespread and common in Hampshire, but scarce on the Isle of Wight where last recorded in 1995. Wingspan 19-22 mm. 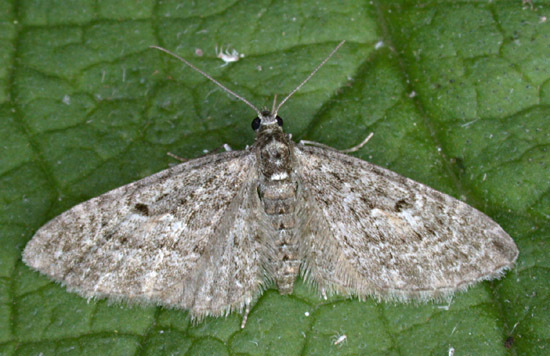 The small, white, raised crest at the distal end of the thorax, round black discal spot, and cross-lines which loop around the discal spot, help to distinguish this large, grey pug from Grey Pug E. subfuscata and Pauper Pug E. egenaria. Larva feeds on European Larch, over-wintering as a pupa.